Now your pup can celebrate his or her birthday with a new favorite toy, the Happy Birthday Loofa! The Birthday Loofa is here to dish up some birthday cheer with his cake, noisemaker, and party hat. The Multipet Loofa dog is a very popular squeak toy and has become a classic. It is the perfect shape and size for your dog to carry with him where ever he goes. 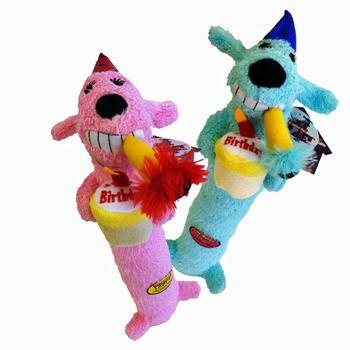 The Happy Birthday Loofa Dog toy is 12 inches long and comes in two colors, pink and blue, please choose the color.